Eating your greens is super important; but don’t forget about your reds, yellows, oranges, blues and purples, too. The colour of our food can be an indicator of its nutritional value. The colourful phytochemicals within fruit and vegetables act as antioxidants, which clear out potentially harmful molecules (called free radicals) before they get a chance to damage our cells. These little colourful warriors protect us from a number of health problems, such as heart disease, cancer, cataracts and even premature ageing. Different colours have different properties, which is why when you’re picking your daily dose of fruit and veg you should select from each of the colour groupings: red, orange/yellow, green and purple/blue. The added bonus of this is that mealtimes will include a variety of flavours and textures, making eating even more enjoyable. 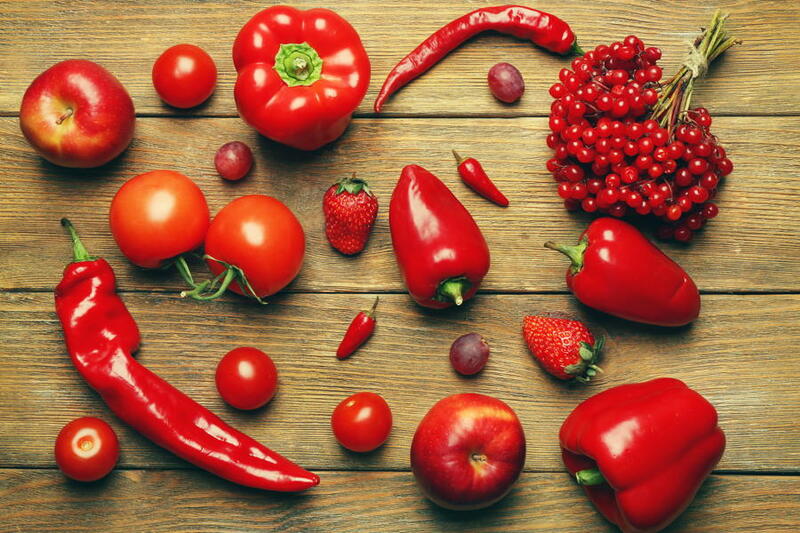 The pigment in red fruit and veg, known as lycopene, is a powerful antioxidant associated with the reduced risk of some cancers – in particular, prostate cancer. Lycopene is also known to protect against heart attacks. We absorb lycopene more easily when food has been heated, so cooked tomatoes are better than raw ones. Fats, such as olive oil, enhance our absorption of this pigment. Examples: tomatoes and tomato-based products, peppers, raspberries, cranberries, strawberries, apples, grapes, watermelon and guava. The age-old saying that carrots help you see in the dark isn’t far off. 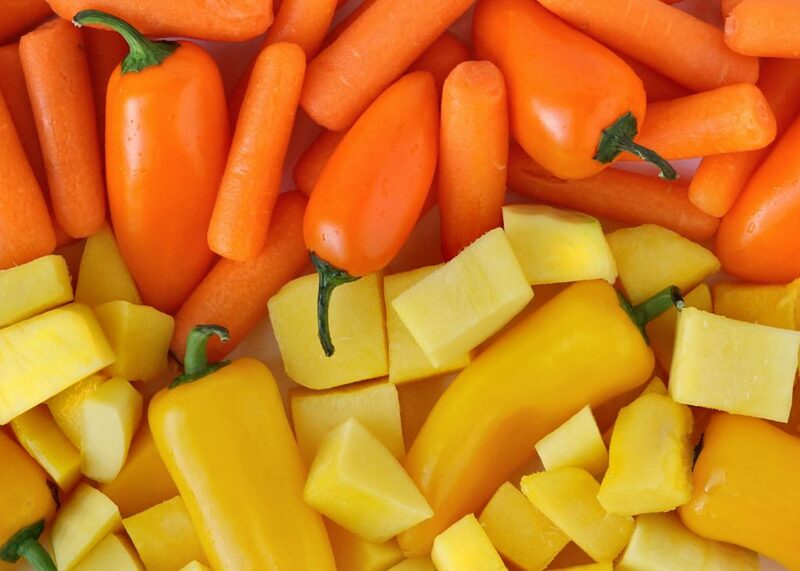 Yellow and orange fruits contain carotenoids such as beta-carotene and beta-cryptoxanthin, which the body converts into vitamin A – which helps you see in dim light. Vitamin A also helps maintain skin and cells that line the airways and the digestive and urinary tracts. Yellow and orange fruit is also a good source of Vitamin C, which helps keep your skin healthy. Examples: Carrots, mangoes, squash, sweet potatoes, pumpkins, cantaloupe melon, apricots. Green vegetables are a brilliant source of vitamin K, which protects against blood clotting and helps wounds to heal properly, as well as of folic acid and potassium. They also contain sulphur-compounds, known to clean up cancer-causing chemicals before they cause any damage. 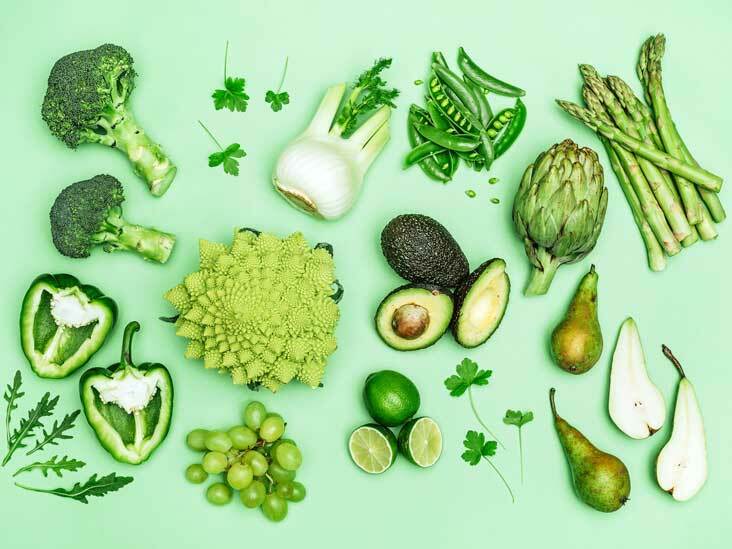 Many green fruit and vegetables are also good sources of two carotenoids called lutein and zeaxanthin, which filter out harmful light that can damage the eyes (a bit like sunglasses). These antioxidants can help prevent age-related eye problems. Examples: broccoli, asparagus, avocado, rocket, spinach, kale, cucumber, leafy cabbage, sprouts, beans, peas, grapes, kiwis and apples. 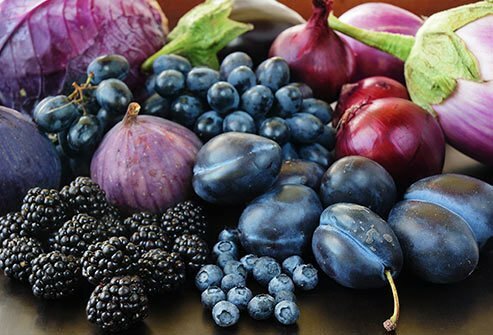 Purple and blue fruit and veg is coloured by phytochemicals called anthocyanins, which are believed to help keep the heart healthy and reduce the risk of strokes. The darker the blue, the higher the phytochemical concentration. Anthocyanins have also been linked to improving balance, co-ordination and short-term memory as we get older. But, there hasn’t been that much research on this, so we can’t be sure yet. Many blue and purple foods also contain ellagic acid and proanthocyanidins, which may help protect against cancer. Again, research is limited on this. Examples: aubergine, red onion, red cabbage, sea kale, blueberries, blackberries, plums, prunes and raisins.